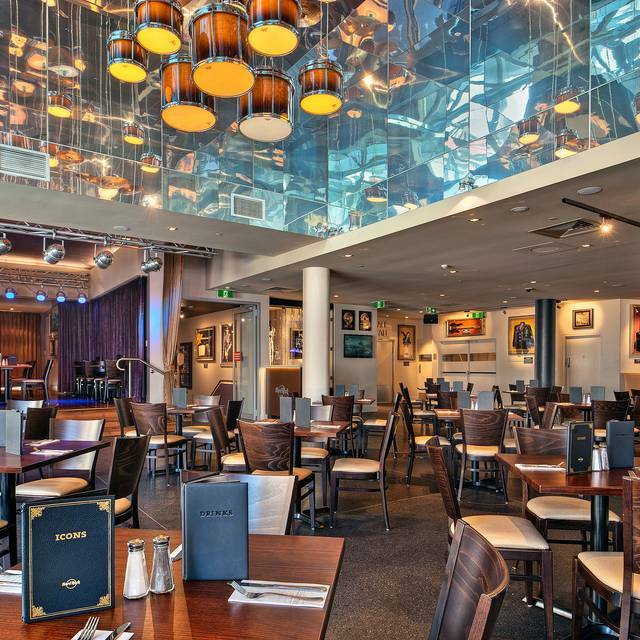 You must make reservations at least 5 minutes in advance of the time at Hard Rock Cafe - Sydney. Park at the Darling Harbour Car Park and spend $30 to receive a parking validation that will bring down your fee. Town Hall Station located on George & Druitt Street. Tram/Light Rail stop at Darling Harbour. Our full-service event venue is perfect for all special occasions. 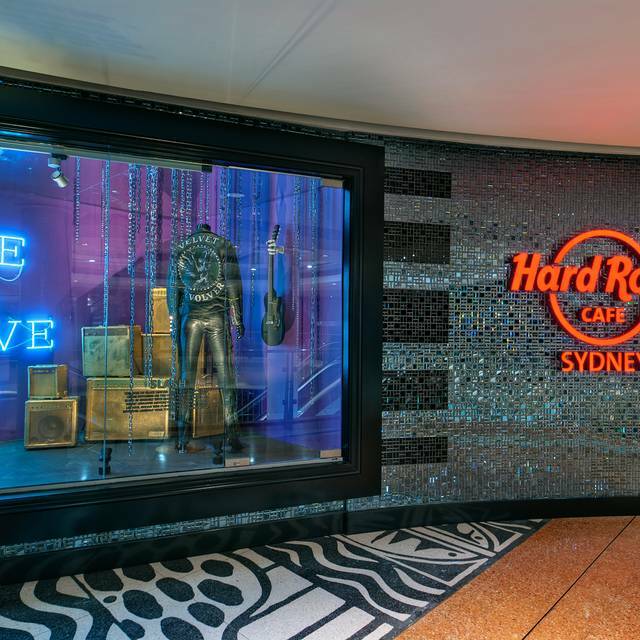 Located in Sydney’s spectacular Darling Harbour, on the first and second levels of Harbourside Shopping Centre, Hard Rock Cafe Sydney is a prominent waterfront venue that will rock your senses with tantalizing food and drinks and an iconic music memorabilia collection. 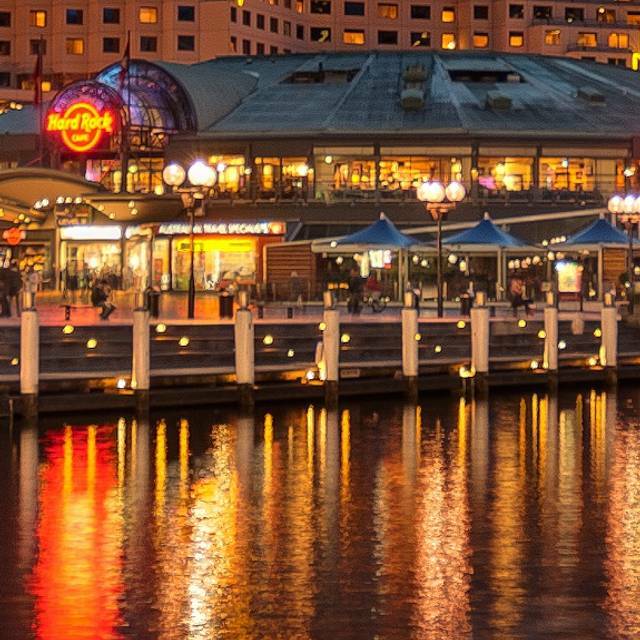 Party all night long by Sydney’s beautiful Darling Harbour waterfront when you host an event at Hard Rock Cafe Sydney. Our full-service event venue is perfect for all special occasions, from album launches to business meetings to Christmas parties. 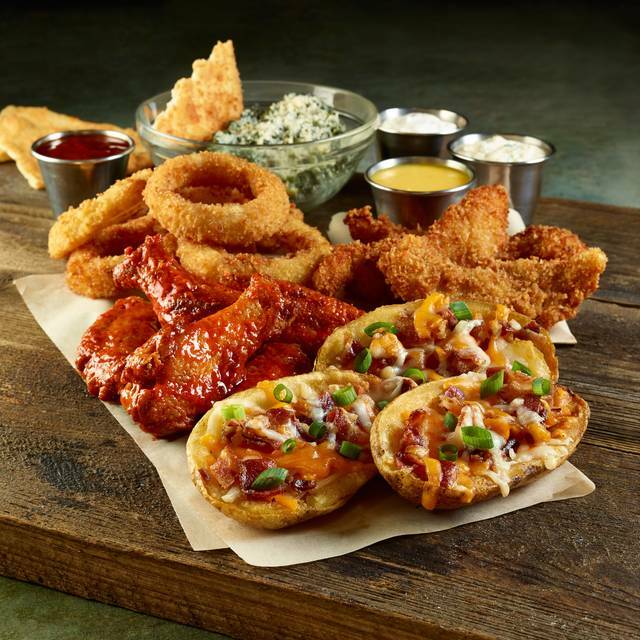 A collection of our most popular appetizers: Signature Wings, Onion Rings, Tupelo Chicken Tenders, Southwest Spring Rolls and Potato Skins. Served with our homemade honey mustard, hickory barbecue and blue cheese dressings. Tortilla chips piled high and layered with three bean mix, Monterey Jack and cheddar cheese, pico de gallo, jalapeños and green onions. Garnished with sour cream. Jumbo wings, coated with our signature smoked dry rub, slow roasted and served with blue cheese dressing, carrot and celery sticks. Choice of Buffalo style or grilled with our Hickory BBQ, Tangy, Classic Rock, or Heavy Metal sauces or dry seasoned. Stuffed with spinach, black beans, cilantro, corn, jalapenos, diced red peppers and Jack cheese. Served with freshly made Hard Rock salsa, guacamole and chipotle ranch dressing. Hand-breaded, lightly fried chicken tenderloins, served with honey mustard and hickory barbecue sauces. Crispy Buffalo style cauliflower "wings" served with blue cheese, celery and carrot sticks. Baby arugula (rocket), thinly sliced grilled chicken, spicy pecans, dried cranberries and fresh oranges tossed in lemon balsamic vinaigrette, topped with crumbled feta cheese. This Hard Rock special combines fresh mixed greens, carrots, corn, pico de gallo and shredded cheese with creamy ranch dressing. Topped with spiced pecans, crisp tortilla straws and your choice of Tupelo fried chicken or a grilled chicken breast. Romaine lettuce tossed in our homemade Caesar dressing, bacon, croutons and shaved Parmesan cheese. Mixed greens topped with grilled chicken, avocado, tomatoes, red onions, egg, smoked bacon and Monterey Jack and cheddar cheese. Served with choice of dressing. Our fresh 8 ounce Angus burger patties are made with our proprietary blend of premium grade beef. Grilled medium well (unless you say otherwise) and served on a fresh Hard Rock burger bun with seasoned fries. All burgers come with special sauce. Add a side Caesar ($8) or House Salad ($8). A beef burger basted with hickory barbecue sauce and topped with caramelized onions, cheddar cheese, crisp seasoned bacon, crisp lettuce and vine-ripened tomato. Topped with spicy fried onions, fried jalapeños, pepperjack cheese with arugula, vine-ripened tomato and sriracha mayo. A homemade patty of quinoa, red onion, portobello mushroom, eggs, pecans, barley, soy sauce, and breadcrumbs, topped with hummus, arugula, tomato, grilled red onion and cheddar cheese. Topped with Jameson bacon jam and Guinness cheese sauce, served with crisp lettuce and vine-ripened tomato. Beef burger topped with crisp seasoned bacon, cheddar cheese, golden fried onion ring, crisp lettuce and vine-ripened tomato. 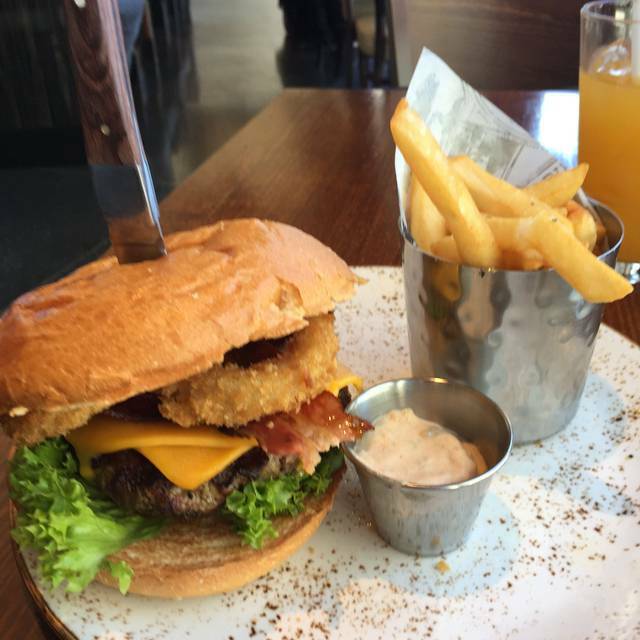 Our local Aussie burger cranks our Original Legendary up a notch to the next level. Melted cheddar cheese, caramelized onions, crisp seasoned bacon, beetroot, a fried egg, lettuce and vine-ripened tomato. Topped with your choice of three thick slices of American, Monterey Jack, cheddar or Swiss cheese, served with crisp lettuce, vine-ripened tomato and red onion. Awakened with espresso rub and homemade lava sauce, crunchy java onions, melted cheddar cheese, crisp seasoned bacon, crisp lettuce and vine-ripened tomato, garnished with a fried jalapeño. Substitute fries for Artisan Fries $4. Get your napkins ready, because our fork-tender signature smokehouse specialties are marinated in awesomeness before they're slow-cooked, right here in our own in-house smokers. Served with seasoned fries, cowboy beans and citrus coleslaw. Sub onion rings ($6) or add a Caesar or House Salad for ($8). 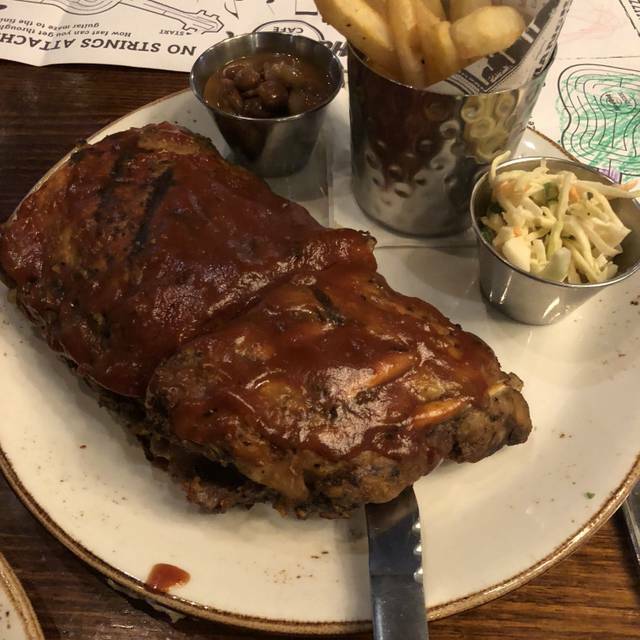 Fall-off-the-bone tender baby back pork ribs, rubbed with our signature seasonings and basted with your choice of hickory or Texan barbecue sauce. Perfect for people who want it all — your choice of ribs, chicken, or pulled pork. Sub onion rings ($6) or add a Caesar or House Salad for ($8). Hickory-smoked pulled pork with chipotle barbecue sauce, cheddar and Monterey Jack cheese, crispy fried jalapeños and onions, piled high on a fresh Hard Rock burger bun. Served with seasoned fries, cowboy beans and citrus coleslaw. Hand-pulled smoked pork with hickory barbecue sauce on a toasted Hard Rock Burger bun. Served with seasoned fries, cowboy beans and citrus coleslaw. Thinly sliced grilled chicken (served cold), smoked bacon, vine-ripened tomato, iceberg lettuce and rich mayonnaise on toasted sourdough bread. Halloumi cheese, grilled zucchini, egg plant, red and green pepper, mushroom and asparagus with spiced mayo. Served with our signature side house salad. It doesn't get any better than this: the freshest ingredients, sourced directly by our chefs and transformed into a feast fit for a rock star. Add a side Caesar Salad ($8), House Salad ($8) or Grilled Shrimp ($8). Your choice of grilled chicken, steak, shrimp, or mushroom served with pico de gallo, Monterey Jack and cheddar cheese, fresh guacamole, sour cream and warm tortillas. 8-oz (225g) fillet, wrapped in cedar paper, grilled tender drizzled with sweet and spicy barbecue sauce topped with herb garlic butter. Served with garlic smashed potatoes and seasonal veggies. Cavatappi macaroni tossed in a three-cheese sauce with Classic wing sauce and roasted red peppers. Topped with Parmesan parsley bread crumbs and grilled chicken breast. A 10-oz (290g) Australian Angus scotch fillet straight from the award winning McDonald family of Byron Bay, New South Wales' North Coast. Char-grilled to your liking and topped with herb garlic butter, served with garlic smashed potatoes and seasonal veggies. Darling Downs Wagyu rump has landed, known for its silk buttery texture along with stunningly sweet delicate caramel flavours, this 9-oz (255g) Wagyu is guaranteed to leave an impression. Char-grilled to your liking and topped with herb garlic butter, served with garlic smashed potatoes and seasonal veggies. Big and juicy 12-oz (340g) New York strip steak, seasoned and fire-grilled just the way you like it. Topped with herb garlic butter and served with garlic smashed potatoes and seasonal veggie. An 8-oz (225g) rump steak marinated in our very own homemade Tennessee barbecue sauce and grilled to your liking. Served with garlic smashed potatoes and seasonal veggies. Penne pasta tossed in homemade alfredo sauce with fresh tomato and spinach, Andouille sausage and chicken grilled Cajun style, then topped with Parmesan-Parsley cheese. 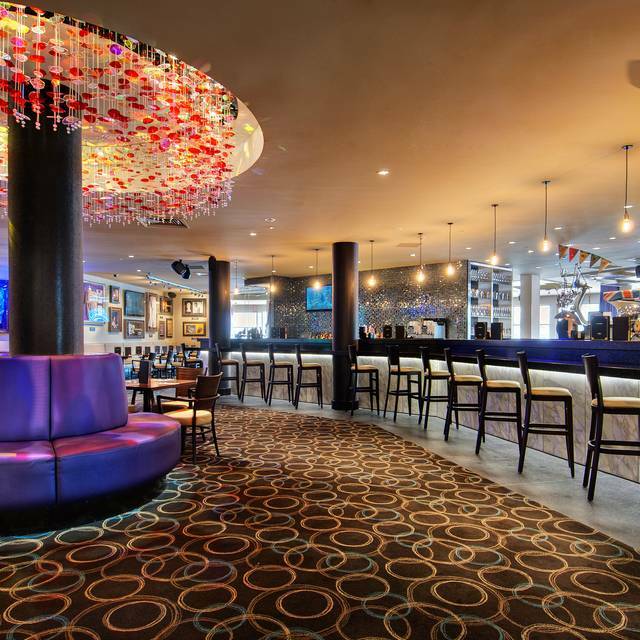 Hard Rock Cafe Wish Dishes: For each wish dish sold, Hard Rock Cafe Sydney & Surfers Paradise will donate $1 to Make-A-Wish Australia® to help grant the wishes of children with life-threatening medical conditions. Served warm with vanilla ice cream, topped with walnuts and caramel sauce. Thick, juicy apples & walnuts are mixed with the finest spices and baked until golden brown. Our fresh apple cobbler is so good you'll think your grandmother made it! Three large scoops of vanilla ice cream, topped with our famous hot fudge sauce, chopped walnuts, fresh whipped cream, chocolate sprinkles and a cherry. Your choice of vanilla or chocolate ice cream. Another Hard Rock Cafe legend. Can't decide? Try our dessert combo, a smaller serving of Apple Cobbler, Hot Fudge Brownie and Oreo® Cookie Cheesecake. Vanilla ice cream and hot fudge on a fresh homemade brownie, topped with chopped walnuts, chocolate sprinkles, fresh whipped cream and a cherry. Order your drink with a souvenir glass for $28.95! Bacardi Carta Blanca, Malibu Coconut Rum, De Kuyper Crème de Bananes, pineapple and orange juices with a splash of Monin grenadine. Malibu Coconut Rum and De Kuyper Blue Curacao mixed with pineapple juice. Orange, mango and pineapple juices, infused with Bacardi Carta Blanca, Bacardi Carta Oro, Disaronno Amaretto, Monin grenadine, garnished with an orange and marashchino cherry. Bacardi Carta Oro, Cointreau Orange liqueur, Monin Orgeat and a splash of lime, grenadine and orange juice. Malibu Coconut Rum, De Kuyper Crème de Bananes, sweet & sour and strawberry purée, topped with lemon-lime soda. Malibu Coconut Rum blended with fresh bananas, strawberries and homemade piña colada mix. A twist on the classic, Old Forester Bourbon meets Angostura bitters, cherry bitters and maple syrup. Garnished with a crispy bacon strip. Stolichnaya Vodka, Beefeater Gin, Bacardi Carta Blanca and De Kuyper Triple Sec with sweet & sour and a splash of Pepsi®. Stolichnaya Vodka, Beefeater Gin and Bacardi Carta Blanca mixed with sweet & sour topped with lemon-lime soda and Chambord Black Raspberry Liqueur. A refreshing blend of Stonefish Sauvignon Blanc, Bacardi Carta Oro and tropical juices shaken with fresh lime, orange and strawberries. Find comfort and soul in this luscious and velvety sangria made with Garfish Cabernet Merlot, Southern Comfort, Chambord Black Raspberry liqueur, tropical juices and berries. Stolichnaya Vodka, Bacardi Carta Blanca, Beefeater Gin, De Kuyper Blue Curacao and sweet & sour topped with lemon-lime soda. Jack Daniel's, Southern Comfort, Chambord Black Raspberry liqueur and Stolichnaya Vodka, mixed with sweet & sour and topped with lemon-lime soda. Frozen concoction of Bacardi Carta Blanca, Malibu Coconut Rum and homemade piña colada mix. Stolichnaya Raspberry Vodka, De Kuyper Crème de Bananes, homemade piña colada mix with a Midori float and garnished with a maraschino cherry. A frozen blend of Bacardi Carta Blanca, fresh strawberries and fresh lime juice. Stolichnaya Raspberry Vodka, homemade piña colada mix and fresh strawberries. Served frozen. Hendrick's Gin and St. Germain Elderflower liqueur, muddled with lime juice, mint and homemade cucumber syrup. Bacardi Carta Blanca muddled with strawberries, mint and lime topped with club soda. Bacardi Carta Blanca muddled with fresh mint and limes topped with club soda. Jose Cuervo Tradicional Plata Tequila, De Kuyper Triple Sec, Monin Pomegranate and fresh margarita mix. Jose Cuervo Tradicional Reposado Tequila, Cointreau Orange Liqueur, Grand Marnier and fresh margarita mix come together to provide the ultimate margarita experience. Jose Cuervo Tradicional Plata Tequila, De Kuyper Triple Sec, Monin Raspberry, fresh raspberries and margarita mix. Jose Cuervo Tradicional Plata Tequila, Bacardi Oakheart, orange juice, mango purée, and Monin Grenadine. A tropical blend of mangos, strawberries, pineapple juice, orange juice and sweet & sour topped with lemon-lime soda. Red Bull® Energy Drink, mango purée and orange juice. A mix of fresh strawberries and basil carefully muddled together. Topped with lemonade. Monin Raspberry blended with fresh strawberries and orange juice then garnished with a fresh strawberry and orange. *Consuming raw or undercooked hamburgers, meats, poultry, seafood, shellfish or eggs may increase your risk of foodborne illness, especially if you have certain medical conditions. **Gluten free Optional. ^Contains nuts or seeds. 2000 calories a day is used for general nutrition advice, but calorie needs vary. Made a booking for 7:30, didn’t get seated till 8.
delicious food, great service staff, and a great view of the saturday night fireworks. Great night at a great Hard Rock, and we have been to a few. Only downside was that despite booking our table for 8.30, we had to wait 45 minutes to be seated. Also, my rewards card was not accepted, for some reason, and I now have to try & get the points added online. I spent a lot on food & merchandise. Although the food was nice, it was well overpriced. Took too long for food to come out. Even when we had a reservation had to wait 15 minutes for a table, which was in a crowded space. Cocktails were incredibly overpriced. $20 for basically a cup of ice.. overall not impressed. Hi there, Thank you for taking the time to leave a review. I'm sorry that your experience did not meet expectations. We appreciate your feedback and I have passed this on to the team. We will never come again. The service was appalling. We three times requested to be moved from the horrible noise (music?) into the quieter, empty room next door,but this was too difficult for the floor manager to accommodate. She needs lessons in politeness. Food was ordinary at best, and the whole experience one we would very much preferred to have been without. Very disappointing compared to the experience we had at Hard Rock Surfers Paradise. Prices lesning towrds too expensive, prtions small, garlic toast was more like bread. My sisters club sandwich was actually a chicken blt, no mayo or egg, and filling fell out as wasnt constructed well. Very good restaurant, try the ribs, they are delicious ! Hi Nicholas, thanks for the rockin' review!! Hope to see you again soon! Hard Rock Sydney is fantastic - especially if you can get seats outside. We were on the first floor balcony, over-looking Darling Harbour, directly opposite a huge fireworks display. Absolutely magical evening. Food was great, as was the service. There's nothing that could have been done to make our experience any better. Hi Jane, Thank you for taking the time to leave an awesome five-star review. Hope to see you again in the near future! Didn't ask how I wanted my burger and it came out a little red for my liking. Prices are area based of course but still a little on the high side. Other than that, an enjoyable evening and friendly staff. Hi Kevin, thank you for taking the time to leave a review. I have passed your feedback on to the team. Hope to see you back again soon! Excellent service, great atmosphere, very ordinary food with the main meal coming out before the entree. Food was not cooked through and vegetables were raw. Was not worth $140 for 2 people with 2 cocktails a shared entree and one main each. Have been to Hard Rock Sydney previously and this visit did not compare. Food was only average and serving sizes seem to have become smaller whilst price has increased. Service was slow even though it wasn’t busy and no atmosphere at all. Used to be a big fan, not sure I’d make the effort to go here again. I definitely would return to try more dishes. Great service, great music and great atmosphere. Hi Garth, Thanks for the rockin' five star review! Hope to see you back again soon! One of the best meals I have had in a long time. View and service was fantastic. The food at Hard Rock is hit and miss. Their buffalo wings is usually finger licking good but sometimes it’s overcooked, undercooked or not much sauce is tossed. Service is great and it’s a fun environment. I still haven’t found better American chain so I would always go back there and recommend to anyone who is homesick of America. Hi Kevin, Thank you for taking the time to leave us a review. I have passed your feedback on to the team! Hope to see you again soon! 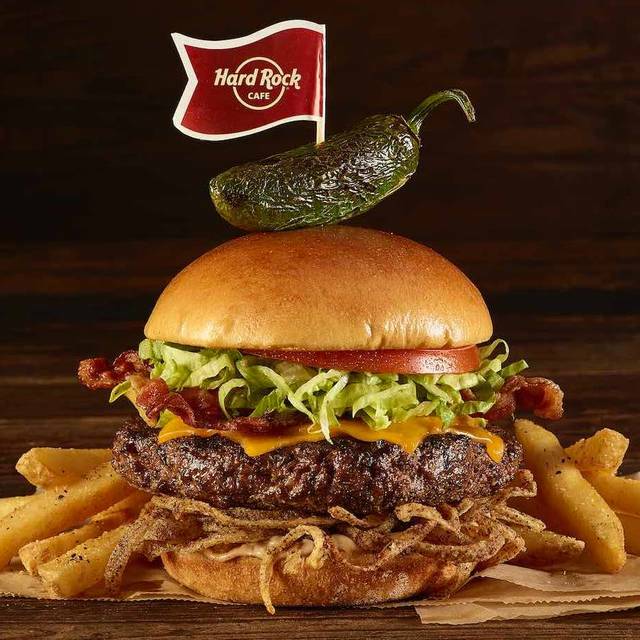 We went to a family reunion at the hard rock café, the service staff were good, very pleasant and did a great job, the food came out in good time and was enjoyed by most at the table, it's a little expensive but we won't complain about that. They are huge meals. 1: one bar staff member decide to put the music up way too loud and turn the place into a day disco, when I ask for music to be turn down nothing changed, about ten minutes later another customer wanted the music turn down and got up and was quite aggressive, it took another five minutes for it to get turned down. 20 minutes of loud music while having a meal is annoying. Note: There went the tip we intended to pay. and we told cashier that as we left. Other negative is the different when paying with cash and card. $288 cash and $303 with card . They had a s/charge of $15. My relative is contacting fair trading to see if that's legal. I just assumed it was the tip some American restaurant chain charge, but I am not sure. Hi Sammy, Thank you for taking the time to leave a review. Apologies for the noise on the day. We value our guests feedback and i will pass this on to the team for you. In regards to the additional charge this is a surcharge that is applied on Sundays and Public Holidays and is common in most restaurants across Sydney. Please feel free to contact us on (02) 9280 0077 if you would like more information regarding this. Rock On! Hi Elena, Thank you for taking the time to leave us a great review! We look forward to having you back again soon! Rock on! I've been to a few HRC around the world, but this one seemed tired and disorganized. The food was on the better side of average but for the price it seemed a little basic. Our waiter just seemed tired and unenthusiastic which isnt really what you expect when you go to a Hard Rock. This became our regular during our recent visit to Sydney. We had happy hours drinks, lunch and an evening meal on the terrace. Good service, fantastic food and pretty reasonably priced. Would definitely return. Hi Amanda, Thank you for taking the time to leave an awesome review!! Hope to see you again soon! Rock On!! My experience here was very hit and miss - the service was friendly and helpful, the food was acceptable, but the atmosphere was somewhat poor, not so much from the background music, which I quite enjoyed, but more from screaming kids at nearby tables and loud talking customers! The water views are lovely. I’d return to eat here, and to try their decadent sounding desserts but probably better during the week when it’d be quieter! There was racism in your restaurant by the hall staff who served us. How come this happened in Hard rock cafe? I don’t believe that. Im Asian. He saying something Chinese to me even Im not. He tried other Asian table and looked so bad for me. It doesn’t matter if the hall staff making customers fun or not. I never go back to the Hard rock any more. Thank you. Young man on the bar was extremely rude and unfriendly so we only ordered from him once before asking for our table early. Waiter disappeared and we waited along time for her to come back, ended up going to the main station to ask if we could pay and was then asked to tip???? We will not be back as this was the last time we thought we would try in the hopes it had improved, it’s just getting worse. Sorry but the service was terrible at lunch time . We love hard rock and we always go for dinner but the service at lunch would make me not want to go again . We were told we would be waiting a while to be served because they were understaffed . It was valentine day so I don’t understand why they wouldn’t have more staff . Took ages for the waiter to take our order I actually had to call them over . Then they gave my husband the wrong drink he asked for a coke and they gave him berben and coke . 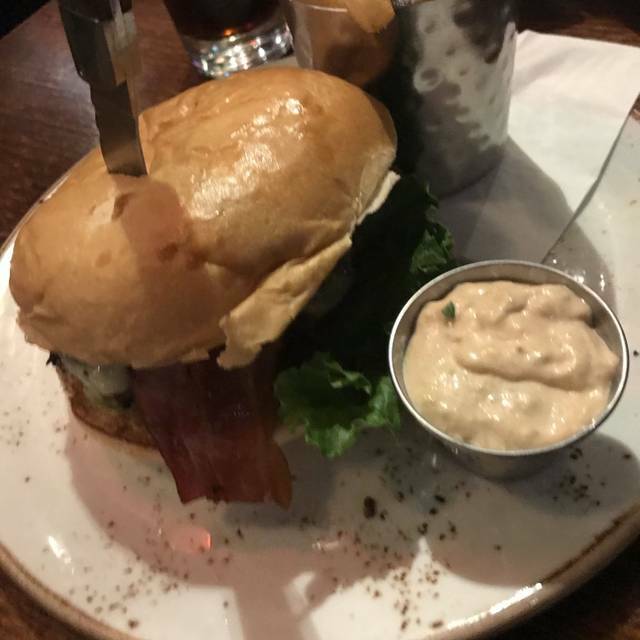 The food I will say was nice but way overpriced I paid $30 for a burger !!! Hi Lisa, Thanks for taking the time to leave a rockin' 5-star review! Come & rock out with us again soon! Our waitress went out of her way to accommodate and make us feel welcome. The atmosphere was great and it was a highlight of our holiday in Sydney. The food was top quality and delicious! Hi Alex, thank you for taking the time to leave us an awesome 5-star review! Come and rock out with us again soon!! The service was by far the best thing. Burger was excellent as in other Hard Rock Cafes that I went before in different cities. Thanks for the rockin' review Juan! Hope to see you again soon! Always good food, you won’t leave hungry that’s for sure. Good selection of beers, and plenty of Rock ‘n’ Roll Artefacts to check out. Especially like the guitar collection and Nikki Sixx’s stripped Suit. Thanks for the awesome review Nicko!! Hope to see you back at the cafe again soon! Always love going to Hard Rock for dinner when have a free weekend. Thanks for the great review Terry! Look forward to having you back again soon! Rock on! Service and staff excellent, sadly most of the food was hot spicy and didnt say, but is good food as always. I still recommend it. Thanks for the great review Max! I have passed your feedback onto the staff! Hope to have you back again soon! We have visited numerous hard rock cafes all over the world however Sydney hard rock didn’t rate highly compared to the others. Poor atmosphere, poor gluten free options (BBQ pulled pork sandwich gluten free option included no bun !! ) and I couldn’t use my hard rock rewards card ! Hi Paula, thank you for taking the time to leave us a review. I have passed your feedback onto the kitchen staff. We hope you give as another chance to impress you on another occasion. Rock on! Had the sampler of all the entrees between two people and it was filling. Skipped mains and had the Brownie Sunday which was nice and very filling. Thanks for the rockin' review Mitch! Come back and see us again soon! Food was terrible for the price. The bathrooms were absolutely disgusting. Service was ok but slow. Hi Joanne, thanks for taking the time to leave us a review. I have passed your feedback onto the team. If you would like to provide us with more information on your experience please feel free to contact us directly on (02) 9800 0077. Brilliant place to go reminese about Rock music. Relaxing time with friends. Tasty menu and nonalcoholic fruity cocktails 🍸 to enjoy. Finished off with Fireworks every Saturday night at 9pm. Thanks for the rockin review Susan!! Come back and see us again soon!! Hi Russel, thanks for taking the time to leave us a review! If you would like to provide us with more information on your experience please feel free to contact us directly on (02) 9800 0077. Hi Mark, thank you for taking the time to leave a review. We would like to hear more about your experience if you would like to give us a call (02) 9280 0077.